Thank You Gift for a Soccer Coach! It's time to thank him or her for all the time, patience, and talent it takes to guide a soccer team. This unique musical picture frame can be customized from one player or the whole team. 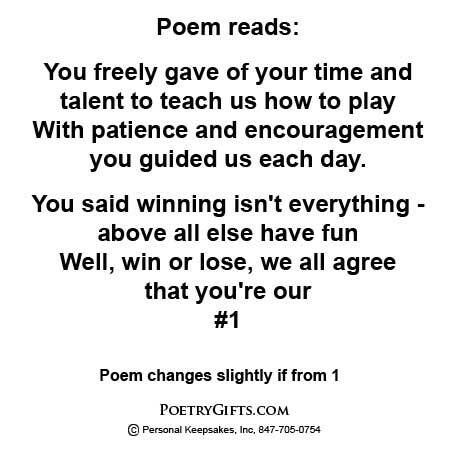 Personalize this Poetry Gift with names to make a truly memorable gift for a favorite soccer coach. 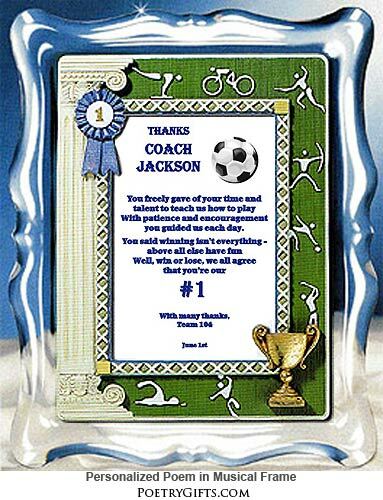 This 3-dimensional blue ribbon and trophy sports frame makes a perfect "End of Soccer Season Thank You Gift" for a favorite coach. Your son or daughter can be proud to give the coach a gift with so much meaning and the coach will appreciate the thoughtfulness and appreciation that goes along with it. Makes a nice birthday gift for the coach too! Acrylic 3-dimensional frame with soccer sport decals - outside frame dimensions 7" x 9"
Poem can be personalized with names and optional date. Verse can also be replaced with a 3-1/2" x 5" photo. The picture frame has a wind-up music box mechanism in the back that plays a rich melodic tune. The song choices are listed above in question #6...or you may choose to have no musical attachment on the frame.